The flaws with commercial floor mats are easy to understand then you take a step back. Who wipes their feet when entering in a commercial or public building, we all do it when we go to a private house but we don’t when we go to a commercial property. Why it is that commercial floor mats are often not big enough to clean our feet properly, is this down to poor building design or is it a lack of understanding of how commercial floor mats work. An estimated 70% of all dirt entering a building is brought in by foot and wheeled traffic, the rest is made up from dirt being blown in or being present in the building. 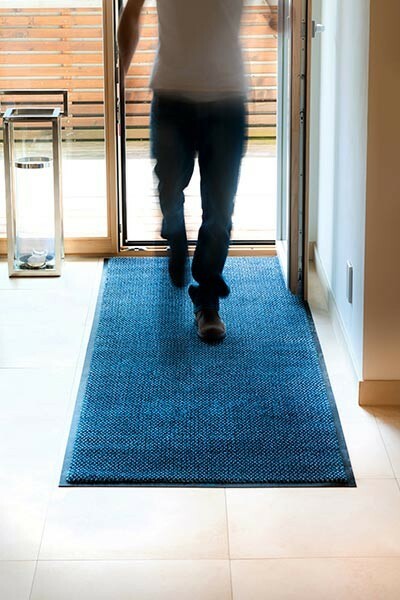 Entrance matting either, recessed matting or loose lay commercial floor mats, should act as a barrier to stop this dirt entering the building. Commercial floor mats work by absorbing or scraping the dirt and moisture off the bottom of the shoe as you walk over the mat. The Science is simple, ideally you need three types of mat, one after the other, these are Primary Mats to remove rough dirt and grit, Secondary Mats to capture dirt and moisture and Tertiary Mats to capture moisture. Ideally should try to achieve at least 5 meters of matting to clean shoes effectively and capture most of the dirt and moisture, however, even placing your commercial floor mat length ways as opposed to width ways will make a difference. At the end of the day it is the number of steps on the mat that cleans the sole of the shoe. Using a mat rental service to supplement your fixed matting is ideal, this is a cost effective way to extend you existing matting and having mats cleaned regularly helps to remove more dirt. Having the right mat coverage will save on cleaning costs and help to prevent slips on wet floors. So next time you enter a public or commercial building have a look at the mats and see if you think the coverage is good enough or will you feel the need to wipe your feet?